The Auto-Receptionist General Settings allow the Account Administrator to set up the Auto-Receptionist and IVR settings on the Office@Hand Online Account. 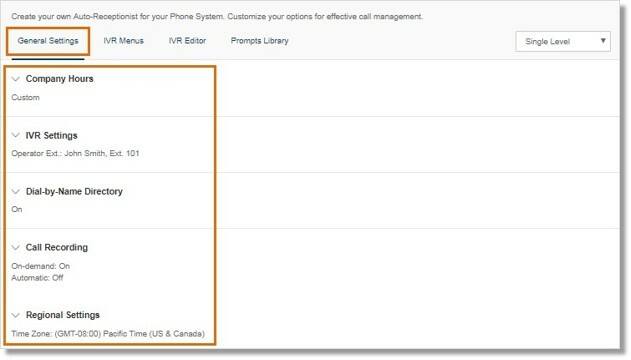 The settings enable calls to be answered automatically with either the default greeting or a personalized recording. The Auto-Receptionist or “Auto Attendant” enables calls to be answered automatically with the default or a personalized recording. Account Administrators can log in to the Office@Hand Online Account to access this section in Phone System > Auto-Receptionist > General Settings. See Auto-Receptionist – Overview | AT&T Office@Hand for more information. The following sections are available on the General Settings tab, so you can set up your Auto-Receptionist and IVR settings. This section lets you define when your company is open to receive calls or closed for the day. By default, your Company Hours is set to 24 hours. See Hours – Customize Company Hours | Admin | AT&T Office@Hand for more information on configuring the Company Hours. This section lets you define how to handle incoming calls during business hours, after hours or during holidays. Greetings or bypass the Company Greeting and route the calls directly to an extension in your account. If you choose to play your Company Greetings, you have the option to use Office@Hand’s default greeting or upload/record your own greeting. You also have the option to disconnect or connect the calls to the Operator if the caller enters no action after hearing your Company Greeting. You can also create Custom Answering Rules for special routing during holidays, specific time of the day (e.g. lunch break) or for special callers. Click on links below to learn more about how you can configure these settings. You can enable the Dial-by-Name Directory feature to let your callers find the extension they want by entering a first or last name using their dialpad keys. By default, all extensions are included in the dial-by-name directory. You can exclude certain extensions that you do not want to be searchable. See Office@Hand: Editing your Dial-by-Name-Directory Settings for more information. You have 2 Call Recording options on your Office@Hand account; the On-Demand Call Recording allows Users to record calls at any time by pressing (*) (9) on a phone dial pad, while the Automatic Call Recording automatically records all calls to and/or from a specific User or Group. See Call Recordings – Enable on online account | Admin | AT&T Office@Hand for more information. This section allows you to configure your Time Zone and Time Format. The Time Format option can be set to 12-hour or 24-hour format. See Hours – Customize Company Hours | Admin | AT&T Office@Hand for more information.